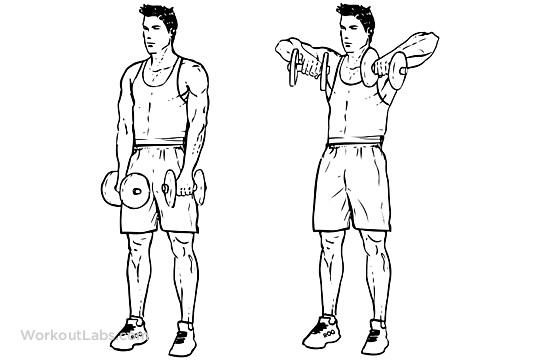 Holding a dumbbell in each hand,stand with your feet shoulder width apart. The dumbbells should be resting on your thighs with your palms facing in. Lift the dumbbells straight up in single smooth movement until they are just below your chin making sure to keep your shoulders back and your elbows out. At the top of the movement, flex or squeeze your biceps and forearms. Hold for a count of one. Return to the starting position slowly to keep tension on the muscles. Note: this exercise can be performed using a barbell,EZ bar or a cable station with a straight bar or EZ bar attachment.